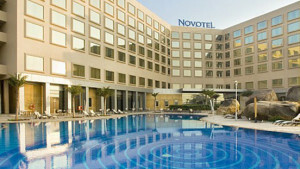 Accor Hotels, recently announced the opening of its upscale Pullman New Delhi Aerocity and the Novotel New Delhi Aerocity. The two hotels, with a combined 670 rooms, were inaugurated at New Delhi Aerocity, a 43-acre hospitality precinct at Delhi International Airport by the Honorable Union Ministerfor Civil Aviation, Shri Ashok Gajapathi Raju Pusapati. The Pullman New Delhi Aerocity and Novotel New Delhi Aerocity are developed as a part of a strategic and joint partnership between InterGlobe Enterprises Ltd, APHV India Investco Pte. Ltd and Accor Hotels. The new Pullman and Novotel New Delhi Aerocity are located in close proximity to the Indira Gandhi International Airport and offer easy access to the prominent business hubs of Gurgaon. In an exclusive conversation with EE, Tristan Beau De Lomenie, GM, Pullman New Delhi Aerocity and the Novotel New Delhi Aerocity talked about what gives these two properties an edge over hotels in the area. Talking about the banquet space in the hotel Lomenie says, "The hotels have one of largest convention spaces in the NCR region, spread over more than 40,000 square feet with a seating capacity of 1800 in theater style and 800 in sitting dinner. Additionally, the combination hotel properties offer a courtyard situated lower ground which can host a cocktail gathering of 500 people. With these features we are sure that the hotels will soon become the favorite choice for everyone to host events and gala dinners." Interestingly, The convention space at the Pullman New Delhi Aerocity comprises of thirteen co-meeting rooms, three boardrooms and a business centre, with flexible seating facility to suit all formats of conferencing requirements. The hotels will serve Indian, Western schezuan mixed with Indian and Pan Asian cuisines via two restaurants in Pullman and 1 in Novotel. When asked if the hotels have any event agencies empanelled to execute their events. Lomenie says, "Not as of yet as so far we have worked with different event agencies." Sharing his opinions on what will give the combination hotel property an edge over other hotels in Aerocity area, Lomenie responded by saying, "Firstly the hotels are high on capacity as we have a huge banqueting space. Then with our third plug hotel Ibis we offer 1200 rooms across different categories which makes it the most event friendly hotel in the Delhi/NCR region."